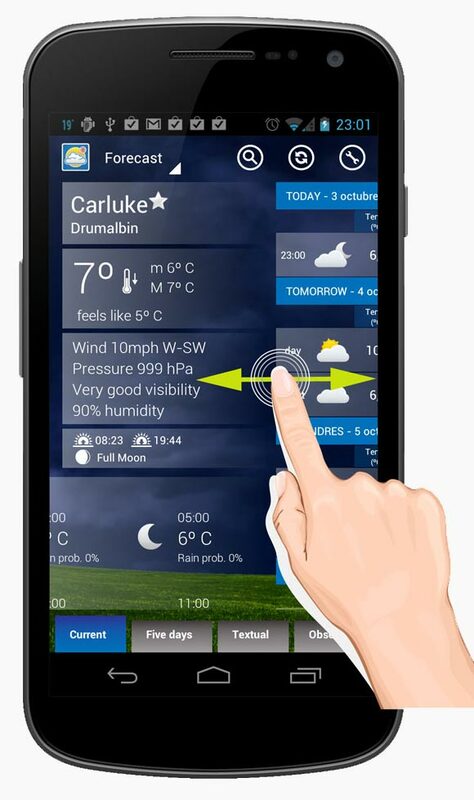 UK Weather starts at Forecast window showing your current location forecast if it can be detected. If your current location can't be detected or you want to search for another use the Search action (the magnifier icon). If you don't type anything in the search box you will see your nearest locations and your favourite ones. And if you enter some letters matching locations will appear. To make a location favourite press on the star next to the location name in Current page. To see your favourite locations press the Search action without typing anything. All current weather information is calculated using the last observation if it's possible or from the actual forecast if observation isn't available. 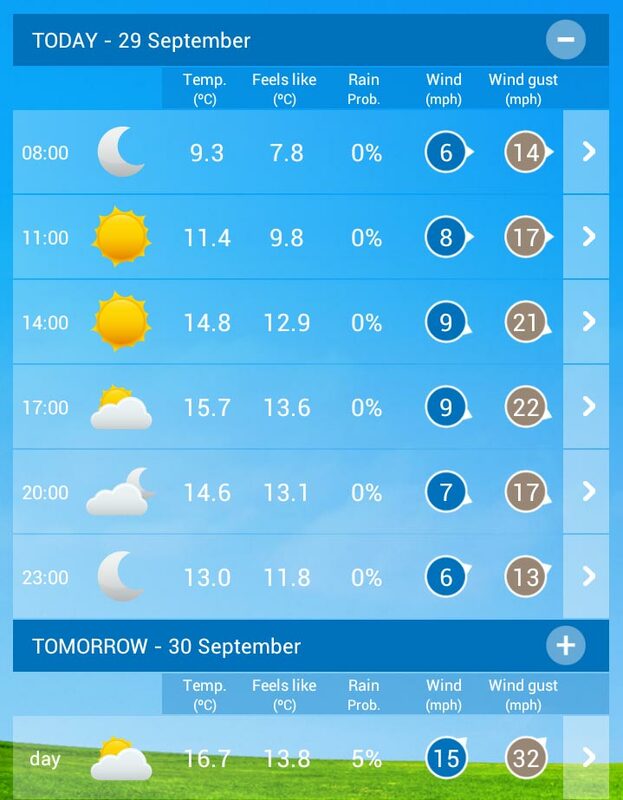 The unique exception are the minimum and maximum temperatures that are from all the day. The temperature comparison is done comparing last observation from the same hour observation from yesterday. 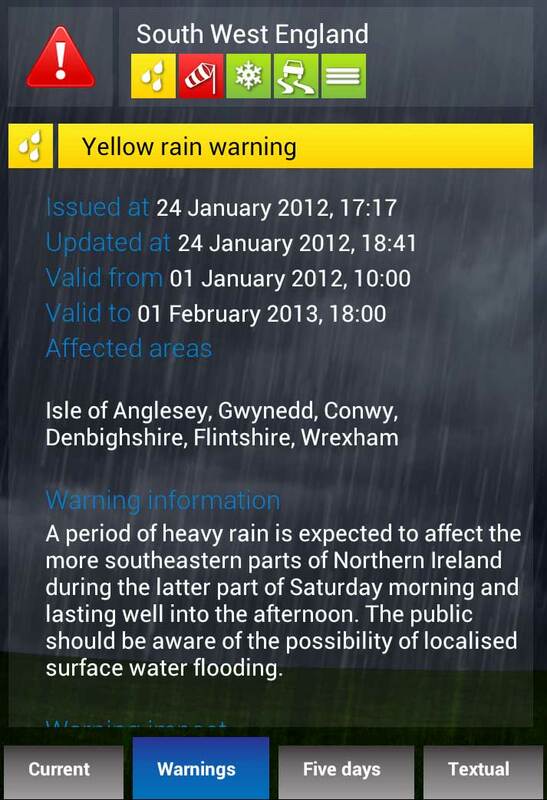 It's only showed if there is an active weather warning for your location's region. By default the information for today is expanded in hourly intervals and the information for the next days is contracted with only day/night information. But you can always expand/contract each day using the plus or minus buttons on the day header. If you are not able to see all the information in your phone width you can use the arrow button on the right to alternate. To alternate between time intervals press on the top tabs. This page show hourly observations from the last 24 hours. For usage please refer to the Five days page because it works in the same way.